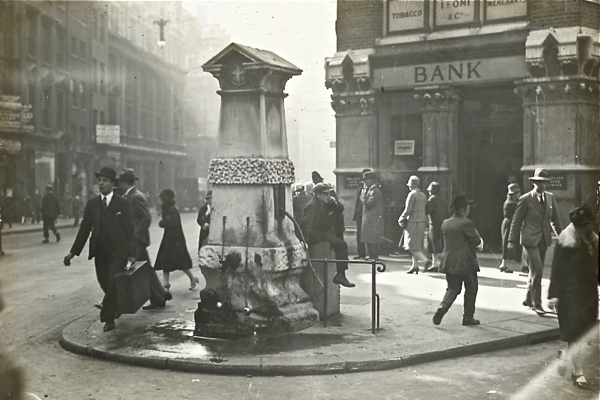 See these people come and go at the junction of Fenchurch St and Leadenhall St in the City of London in 1927. Observe the boy idling in the flat cap. 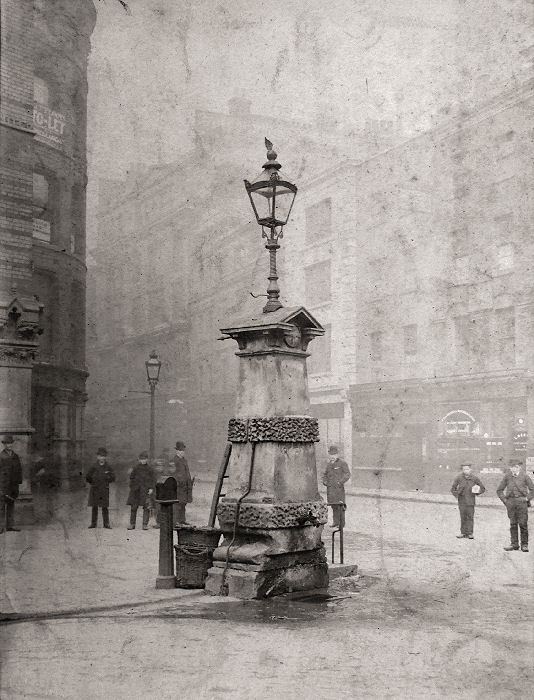 They all seem unaware they are in the presence of the notorious “Pump of Death” – that switched to mains supply fifty years earlier in 1876, when the water began to taste strange and was found to contain liquid human remains which had seeped into the underground stream from cemeteries. 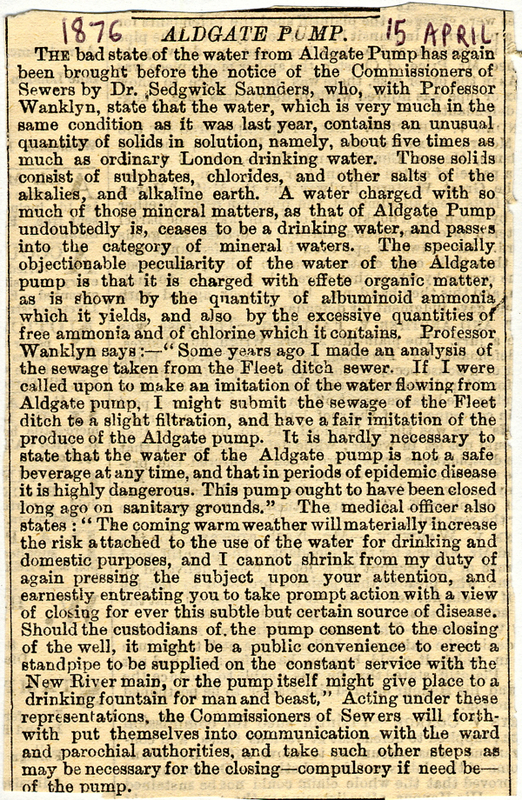 Yet before it transferred to a supply from the New River Company of Islington, the spring water of the Aldgate Pump was appreciated by many for its abundant health-giving mineral salts, until – in an unexpectedly horrific development – it was discovered that the calcium in the water had leached from human bones. 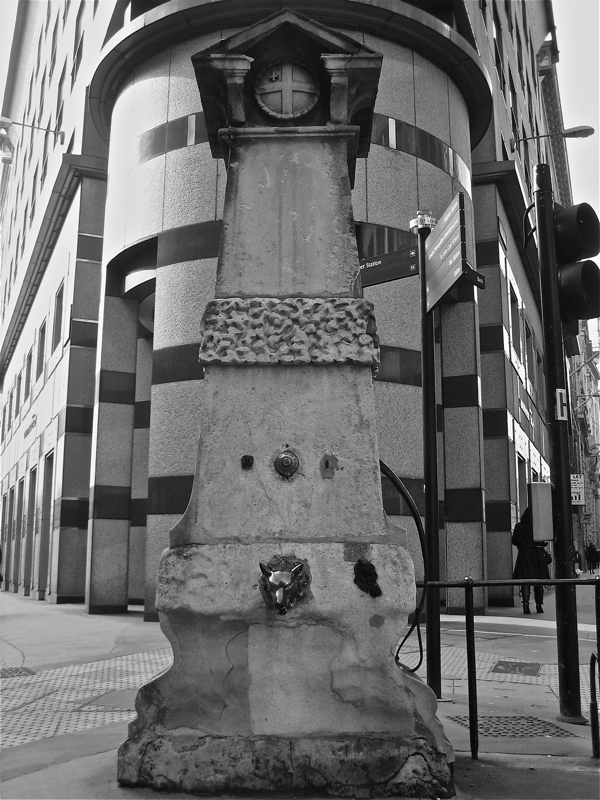 Today this sturdy late-eighteenth century stone pump stands sentinel as the battered reminder of a former world, no longer functional, and lost amongst the traffic and recent developments of the modern City. No-one notices it anymore and its fearsome history is almost forgotten, despite the impressive provenance of this dignified ancient landmark, where all mileages East of London are calculated. 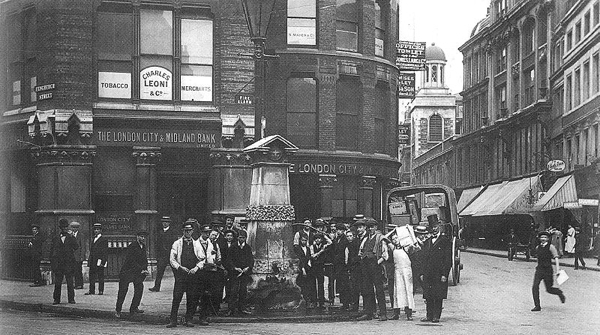 Even in the old photographs you can trace how the venerable pump became marginalised, cut down and ultimately ignored. 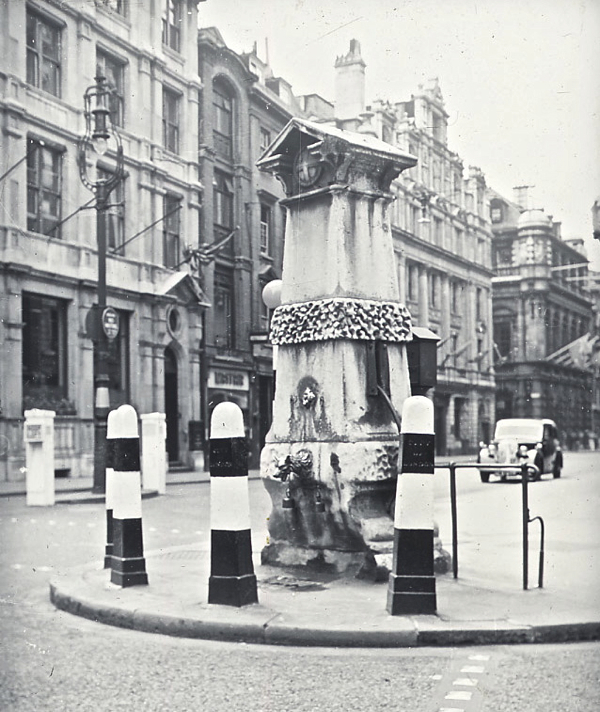 The pump was first installed upon the well head in the sixteenth century, and subsequently replaced in the eighteenth century by the gracefully tapered and rusticated Portland stone obelisk that stands today with a nineteenth century gabled capping. 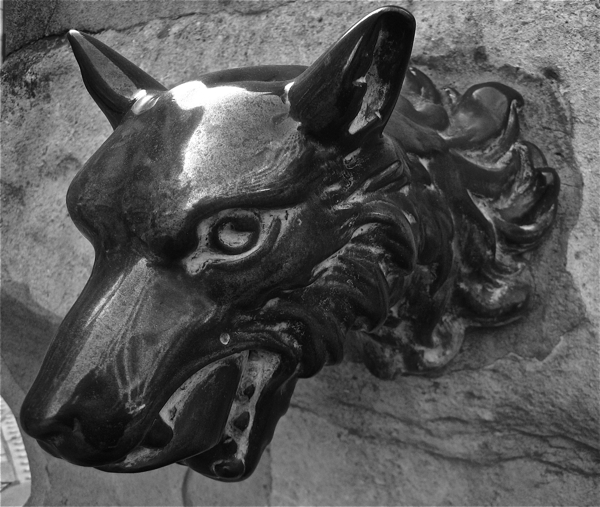 The most remarkable detail to survive to our day is the elegant brass spout in the form of a wolf’s head – still snarling ferociously in a vain attempt to maintain its “Pump of Death” reputation – put there to signify the last of these creatures to be shot outside the City of London. In the photo from 1927, you can see two metal drinking cups that have gone now, leaving just the stubs where the chains attaching them were fixed. Tantalisingly, the brass button that controls the water outlet is still there, yet, although it is irresistible to press it, the water ceased flowing in the last century. A drain remains beneath the spout where the stone is weathered from the action of water over centuries and there is an elegant wrought iron pump handle – enough details to convince me that the water might return one day. 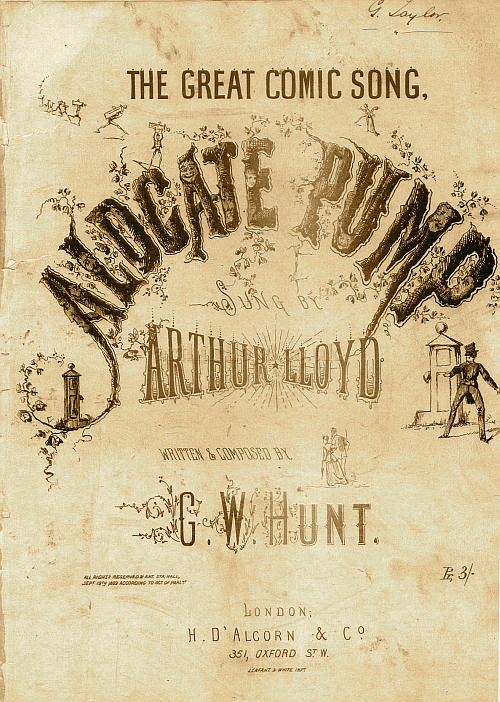 The pump was closed in 1876 and the outlet switched to mains water supply. How fascinating! 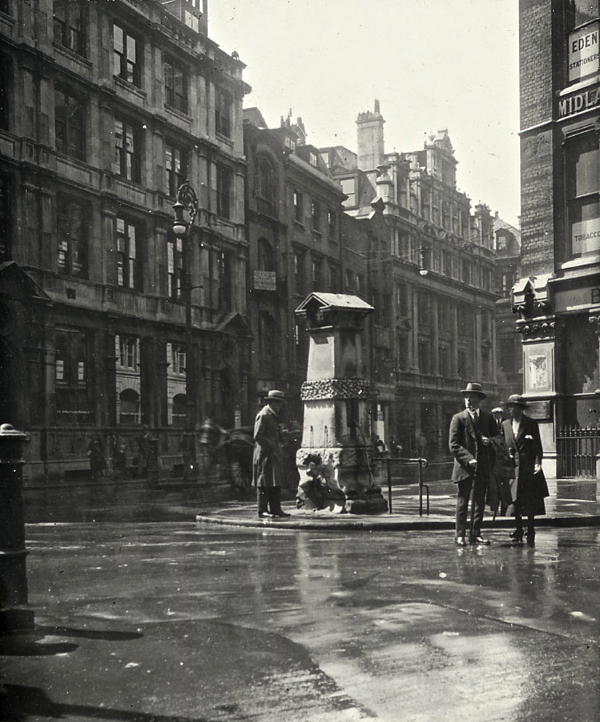 That first modern photo you put up, with the pump holding its own architecturally against the ubermodern building behind it, is absolutely brilliant. Interesting that the timing of the water switching coincided with other water cleanup projects like the Embankment, etc. 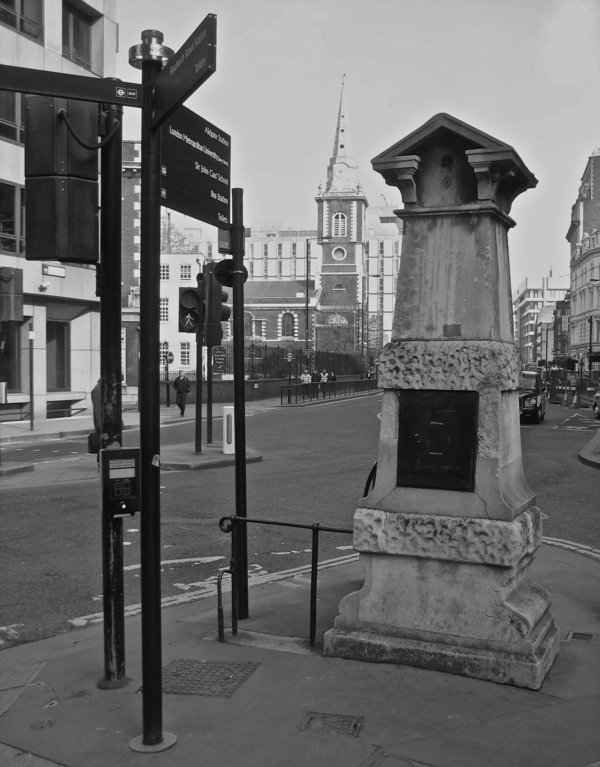 Also, didn’t know that Aldgate Pump was the signifier of the beginning of the East End. I learn so much from this blog! A great bit of history, I will pay it a viset.